A PROPOSAL for A SEMI -STELLAR BODY ORBITING SOL== "Lucifer"
It is proposed that there is strong evidence for a very large, dark, body orbiting Sol at a median distance of about l.389 light years (period 26.2 million years). It is suggested that we need to search for Such a body. It must be in a highly eccentric orbit such that it returns to the vicinity of the Solar system every 26.2 million years. The last such Intrusion was about 11 million years ago, hence, it will be near the maximal distance now. The evidence for such a body comes from three sources. 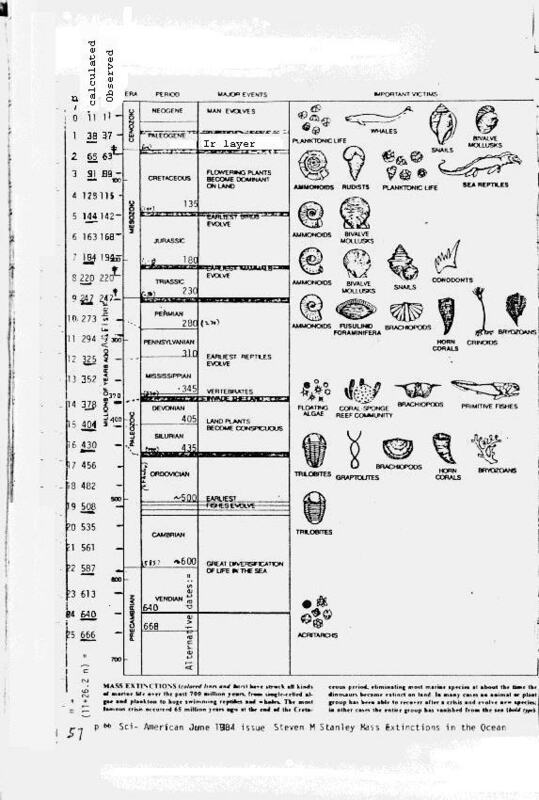 First and most importantly is the periodic mass extinction of species reported by A.G. Fisher (but he did not completely determine the period). These extinctions occur with an equation of 11 + n(26.2) million years into the past. They can be traced for a full 25 cycles back to 666 million years ago. Cycles 1, 2, 5, 8, 9, 12, l4, 15, 16, l9, 22, 24, and 25 are all clear and involved in most cases up to a 95% extinction of all species. Cycles 3,4,6,7, and perhaps 17 are lesser extinctions at perhaps a 75% extinction level. The second evidence of such a body is Pluto--a former moon of Neptune that has been torn from its orbit about the former primary. The periods of Pluto (248.35 yrs) and Neptune (l64.784 yrs) suggest a common element of 40,924 years for the most recent event of 11,000,000 years ago requiring 268 full cycles, thus we can not with any surety calculate the exact times because of the imprecision in the numbers. However; there is one more significant point: the vector to this postulated body is directed by the line where the two planes of the Orbits of Pluto and Neptune intersect. That also would be the place where their orbits (if run backwards to account for precessions etc) meet. The orbital planes should change little enough; however, that they will provide an adequate vector pointing in the right general direction with length set by the 1l million years Out of 25,2 million years period "LOOK THERE,'"
The third evidence is the cometary and irregular asteroid debris of the solar system. In a static situation one would expect circular orbits and irregulars to be missing. If there is an intruder, then it would stir things up every pass and we would expect to find minor asteroids in eccentric orbits just as we do find. In fact the asteroids may be the ruins of a former small planet which was broken up by this visitor which carried off as much a 90% of the mass, leaving the residual Iron (core) and Rocky(mantle) fragments which we now see. The name LUCIFER has been previously proposed for such a planet. I will second that motion. If indeed it brings the chaos that this theory predicts, and if it did cause mass extinctions, and break up a minor planet, then that name is all too appropriate. It should be of stellar mass, but with enough heavy elements to quench the solar (hydrogen)fires. It should have perhaps as much 0.1 Solar masses- larger than Jove. It will have to be detected by non-conventional means since it will be too dark and too far for telescopic reflection of Solar light. I.R. or Radio telescopic observations perhaps will be of use. Perturbations of Pluto which in 1917/78 predicted a "l0 th planet" perhaps can also be used to pin down the location of this postulated body.